Gyroscope offers a convenient, standard interface for context-sensitive lookups. For example, in a form that books house viewing appointments, there's a field for entering the property address. 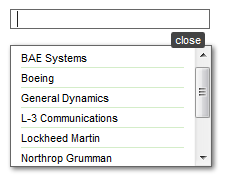 The picklookup function is also defined in autocomplete.js. The function works with listlookup and populates the auto-complete-enabled input field with the first parameter. In addition, it attaches the record ID to the input field. In the above code example, the identity of the lookup is enforced. We perform the search based on the address of a property. It is the ID of the property that we're submitting to the form handler. It is possible that the user alters the search string without clicking on a new search result. The form submission will use the previously looked-up ID; and this could be confusing. The new picklookup function and its variants will automatically lock the input field and display the unlock button. The makelookup function is defined in myservices.php. It takes a second optional parameter $fullscale. When this parameter is set to true, the lookup view will have no clipping. This is useful for displaying calendars inline. By default, inline lookup is only triggered in a mobile device when viewing in portrait mode. The left lookup panel is used to better utilise the screen space. Starting v5.6, the function signature for the date picker has changed to make the code more maintainable. Note the start and end times are in 24-hour format. The picktime function skips the calendar and displays the time line directly. There is no _picktime function for the onkeyup event. Although the three lookup functions are invoked identically, their input values require different handling. pickdate populates the input field with a yyyy-mm-dd string, which is validated by the valdate function and converted to a UNIX timestamp by using the date2stamp function. pickdatetime and picktime populates the "value2" attribute of the input field with a UNIX timestamp. The visible input value is for display only. It is up to the server side logic to extract the hour and minute information from picktime. The recommended storage format is 24-hour stamp. For example, 5:45pm is coded as 1745.